To assist MYFIs to comply with the requirements under the Malaysia-US Intergovernmental Agreement, Digicert shall facilitate the process for MYFIs to enrol and transmit FATCA report to IDES. Foreign Account Tax Compliance Act (FATCA), which affects Financial Institutions (“FIs”) worldwide, aims to reduce tax evasion by United States (US) citizens. It requires Financial Institutions outside the US to provide information regarding their customers who are US citizen to the US Internal Revenue Service (“US IRS”). A 30% withholding tax is imposed on the US source income of any FI that fails to comply with this requirement. The US has developed Intergovernmental Agreement models as tools to facilitate FIs' compliance with FATCA. For the purpose of FATCA reporting, US IRS has developed a platform called International Data Exchange Service (IDES). 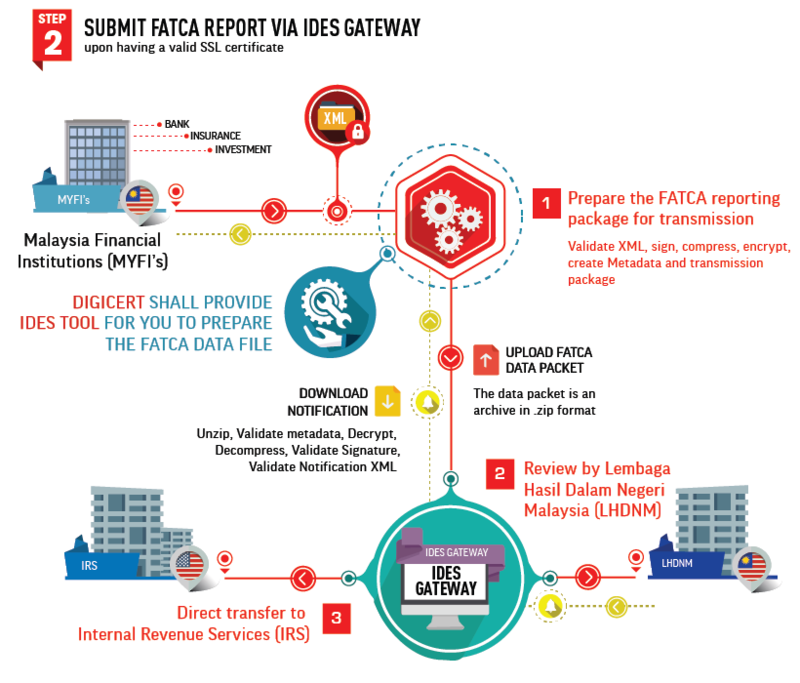 All Malaysian FIs (MYFIs) are supposed to enrol for (IDES) system to submit the FATCA Report. Digicert together with Bank Negara and LHDNM shall facilitate the IDES implementation for all FIs in Malaysia. Lembaga Hasil Dalam Negeri Malaysia (LHDNM) has also provided the Draft Guidance Notes on FATCA compliance. Reporting MYFIs shall transmit their FATCA reporting data to LHDNM via the IDES system. LHDNM will in turn authorise the onward transmission of such data held at the IDES to the US IRS. Generate the FATCA reporting data file in accordance with the FATCA XML Schema. Note: Digicert will help you to provide Entrust SSL Certificate that can be used to enrol IDES. Digitally sign, compress and encrypt the FATCA reporting data file with the MYFI's AES-256 key. Encrypt the MYFI's AES-256 key with the US IRS' public key, and encrypt a duplicate of the MYFI's AES-256 key with LHDNM' public key. Create the FATCA reporting package by zipping up the FATCA reporting data file, the AES-256 key for US IRS, the AES-256 key for LHDNM and a transmission metadata file. Note: Digicert IDES Tool can be used to prepare the FATCA data file upon having a valid SSL certificate. 4. Transmit the FATCA reporting package to LHDNM via the IDES.